Pomegranate flower honey - 6 u. If you are looking for gourmet products online, this is your section! In our gourmet area we have selected the best pomegranates, fruits and vegetables, grown by ourselves in Alicante, Spain, to bring to your table all their flavour in delicious and healthy products. Among our gourmet products online you will find a catalogue that will delight lovers of cuisine, good food and natural products. If you are looking for special ingredients for your new creations, to surprise your guests, treat yourself or take care of yourself naturally at all levels, these Vitalgrana products will enchant you. They are the perfect pair for meats and cheeses, perfect to create original garnishes, to accompany salads, for toasts, drinks and, much more! 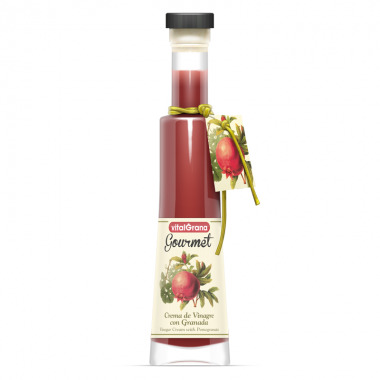 Among our online gourmet products, we can highlight, for example, the cream of vinegar with pomegranate made by hand - ideal to give a special touch to all your dishes - and pomegranate flower honey - a unique product obtained from hives located in our pomegranate fields - perfect to give the sweet touch to your creations or create delicious contrasts. In addition, if you want to give a gift, or if you are looking to start taking care of yourself, in our online gourmet store you will find several packs that will adapt to your needs. 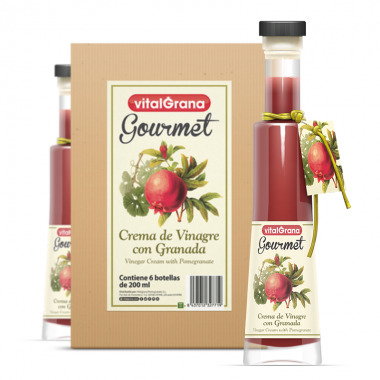 Juices combined with vinegars and jams to enjoy the most authentic Vitalgrana experience, or Vitalgrana conventional or organic juices with Vitalgrana Omega 5 and vinegars so you can start eating in the most healthy and natural way. Browse our store and discover the selection of gourmet products we have prepared for you, you will love it!